I have been having trouble with my website rankings ever since I changed from http to https – I was checking my rankings with Market Samurai – and it seems like the Trust Flow (TF) and Citation Flow (CF) are split between http and https – as if they are 2 different sites. My Trust Flow fell 17 points since I switched to https! 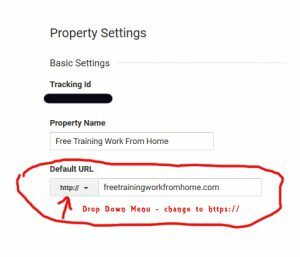 See how the Trust flow of https://freetrainingworkfromhome.com is 23 in the (above) screenshot? In this next one – two days later – the Trust Flow is down to 6! I thought I had told Google that I preferred https – but when I checked tonight – my site was still listed as http with Google! Usually, for a tutorial like this, I would do a video – but I don't see how I can do a video in Google Analytics. There is just too much sensitive information. Screenshots are going to have to do! 1.) 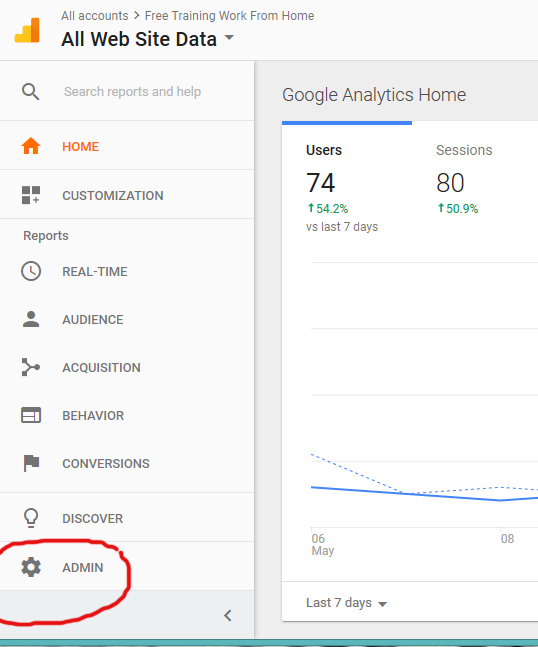 Sign in to Google Analytics (hopefully you are already signed up for an account and you added your website – if not – you need to set up your website in Google Analytics first. 2.) From the home page, click on Admin – in the left, side bar, at the bottom. 3.) That will bring you to a page with 3 columns. 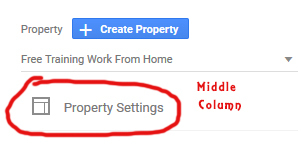 In the center column, you will see, Property Settings. Click on that. I started this blog on March 12 – so it's been in existence for almost 9 weeks. I will keep giving reports on how we are growing – because we will keep growing as we put out more useful information to help you start a business website! On April 16th, I did list in some directories for backlinks – and this could have brought the Trust Flow down! My traffic is still increasing at a rate of 50% per week – so I am not going to worry too much about the low Trust Flow – although I will keep looking for ways to raise that Trust Flow! I am hoping the change from http to https in Google Analytics moves all the Citation Flow and Trust Flow over to the https URL. I will keep an eye on it and blog about it again. I would love to hear what you think of the split personality website I have since I changed http to https. Have you ever had a similar experience? Thanks for this great informational blog post. I didn’t even know that you could switch between http and https! Is there a reason why you should? If you have SSL on your site – you are now using https:// — if Google still has you listed as http:// — it splits your site in two. So your efforts to build domain authority are also split in half. You will have to work twice as hard to get rankings in the search engines and you will get half the traffic you are earning by continuing to put out great content. Your site is https – and likely Google does not know it if you did not tell them. Do the steps in this blog and it get you more traffic! I was glad to come across this article. As I was reading it I accessed Google Search Console to check if my website’s setup in Google Analytics was correct. Fortunately, everything was already up-to-date. I’ve never used Market Samurai. It seems a pretty good tool. I’m sorry for the ignorance but I’m not familiar with the terms “Trust Flow (TF)” and “Citation Flow (CF)”. Could you give me a quick explanation? Not ignorance at all – as a matter of fact – as I was writing this – I was thinking – most people don’t know what Trust Flow and Citation Flow are. The short answer is, Trust Flow and Citation Flow are ratings that Majestic uses. Citation flow measures the amount of “backlinks” you have pointing at a page while Trust Flow says whether those backlinks are trustworthy. You get points off for low trust flow sites pointing to your site! You can “disavow” links from sites that don’t have good trust flow – or just avoid getting links from low trust flow sites. The long answer is – I am going to write a post on it. Hi Heather. Why do you think posting to the article directories has reduced your overall standing? I thought it was necessary to do this for SEO purposes. Personally I’m still coming to grips with the amount of information google analytics gives. I haven’t made it past the first tab as yet! I hadn’t heard of market samurai either. I’ll check it out for sure! Thanks! Wow! I never knew anything about Trust flow and Citation flow until now. I am new to WA, its been 3 months now and I am still going through all the training. I will definitely have to look at my google analytics to see what my account is reading. Thanks for the info. Thanks for the information. I will go check it out now. I didn’t realize you can change http:// to https:// and the impact on it had on traffic. What is the difference between http and https? Instead of HyperText Transfer Protocol (HTTP), this website uses HyperText Transfer Protocol Secure (HTTPS) – if you have SSL or you are hosted with Wealthy Affiliate and you are using the SiteSSL (HTTPS) – your site is https – and you would have to notify Google of the change. You can tell by copying your URL from the address bar – what is the prefix. Is it http or https?